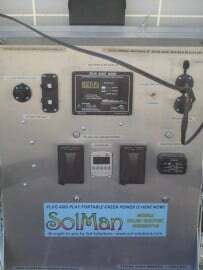 Editor’s Note: This is a guest post by SolSolutions, who designs and builds the SolMan line of solar generators, solar light towers and custom solar power systems. These solar products meet a need for Tiny Home power, emergency backup, off grid power, and temporary power or lighting. SolSlutions is fully committed to helping customers to integrate their ideas with practical solutions to achieve energy independence and efficiency using quality, well-built products. The following “Solar Power for Tiny Homes” white paper offers an overview of the various considerations and planning needed to use solar power for your tiny house. Tiny Home owners value sustainability, a reduced footprint and the do-it-yourself mentality. The great thing about Tiny House living is that it is efficient. This makes using renewable energy very feasible and easy to incorporate into the lifestyle without too much sacrifice. Solar is the cheapest and most effective renewable energy on the market today, making it a great power match with the Tiny Home. 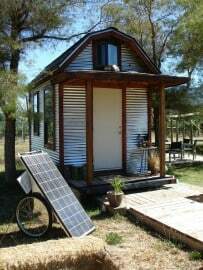 This article discusses how Tiny Home owners can utilize small solar systems as their main power source. It includes information on what types of uses solar electricity works well with, the types of solar available for your Tiny Home, and how to wire your Tiny Home for solar electricity. To note, if a Tiny Home is going to be located with grid access and/or use all electric heating, water heating, air conditioning and cooking, using solar as the main power source will be very difficult, either in application or cost comparison. Using small solar power as your main electric source requires management and efficiency. Therefore, some applications work well with solar, whilst others don’t fit with the conservative nature of renewable energy. From a pure energy efficiency standpoint and for practical considerations, we recommend using propane for your cooking, heating and hot water, especially if you would like to have the rest of your electric renewable and clean with off-grid solar. Heating and cooking are very high-energy draws and will deplete your solar power system’s battery storage very fast, unless you have a large enough system. 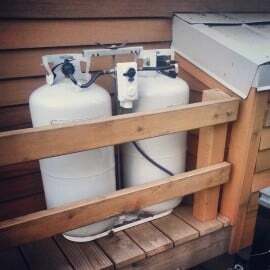 One or two 5 to 10 gallon propane tanks can be mounted on the trailer tongue of the Tiny House and can be setup just like an RV or trailer with alternate tanks, so it never runs out. The RV/trailer suppliers are good sources of all this stuff, including small ranges, small heaters, and small on demand tank water heaters. You would want to consider running a small copper propane line, or flexible line inside to your applications at the same time as your wiring job. In terms of lighting, LED lights are recommended as they maintain very little electric use and are super efficient. 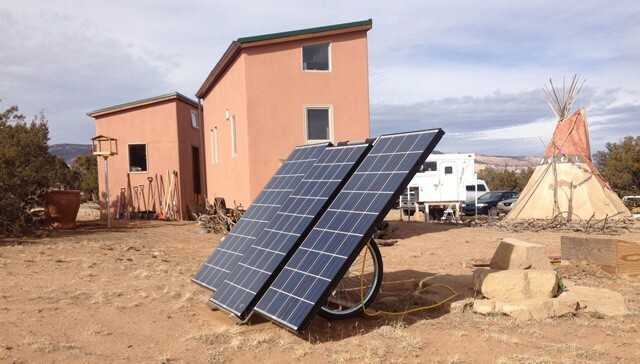 Other uses like personal electronics, video, computers, fans, smaller Energy Star rated refrigerators, blenders, and tool charging are good applications to be handled by Tiny Home off-grid solar power. Beyond this, occasional electric hair dryers, toaster ovens, microwave ovens, or electric tea kettles are usable for short bursts, but you do not want to leave them on for long, as they can take up to 1000 watts, depleting your battery storage quickly. To do this, brainstorm all of your potential uses and then add up all the wattage draws of those applications. Some appliances may be listed in volts and amps, but there is an easy conversion to watts. Volts multiplied by amps give you watts. Watts are actually calculated in watt-hours, so a 30-watt light bulb for example would draw 30 watts per hour. Average daily watts would be based on the sum of your estimated usage time of each application over a day. For example, using two 20 watt LED bulbs four hours a day, a 60 watt computer two hours a day and a 150 watt computer one hour a day would give you a 430 watt average daily wattage use (2 x 20 x 4 + 60 x 2 + 150 = 430). Your maximum potential watts pulled is then the sum of everything you might use at once. So, in the above example, using all at the same time would pull 250 watts total (40 + 60 + 150 = 250). 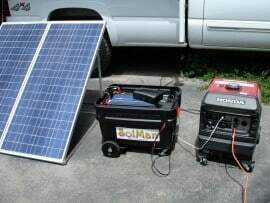 There are two main types of solar power systems for off-grid locations, a portable solar generator or an installed system. 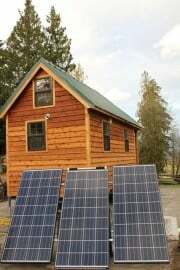 If a Tiny House is in a location with grid access and you are wishing to supplement your grid power with solar, a grid-tied system is the usual route. This article will focus on the off-grid solar options. Overall, we recommend portable solar generators for Tiny Home owners as they can be moved easily with the home, allow for solar tracking (see below) and fit with the efficient and mobile lifestyle of most Tiny Home residents. However, it is important to note that depending on your location, both within the country and the topical geography (valley, mountains or forest), solar might not be available all day or year-round. In this instance you may be able to get 50-75% of your power from a solar energy system, but will need to augment it with an alternative power source. For 24/7 off-grid power, a hybrid system with your solar generator or fixed solar system combined with a gas generator will suit a Tiny Home well. This combo will allow you to fast charge your batteries via the gas generator when they are low. You can also plug straight into the gas generator for higher energy draws. By utilizing this system, you would significantly reduce your gas generator usage and ensure you have power available in winter, rainy days and at night. Traditional lead acid batteries should only be discharged of 2/3 their capacity to preserve life span. Some newer battery technologies like lithium and carbon fiber can be discharged further. As an example, a 100-amp hour 12 volt lead-acid battery would yield 800 usable watt hours (100*12*2/3). With this figure you can then determine how long your solar generator will run specific applications. 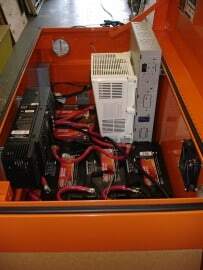 In this manner, a solar generator with one 100-amp/hr battery could run a laptop with a 100 watt draw for 8 hours (800/100) before it would need to be recharged. Solar panels are rated by their watt-generation capabilities. For example, a 140 watt PV panel generates 140 watts of inbound power in full sun. Full sun lasts about 6 hours during the day, generally from 10am to 4pm. At other times of the day, PV input still comes in, but can be less than rated. Furthermore, letting batteries sit without a full charge or not fully charging the batteries before night usage cuts their lifespan short. This further cements the need for solid PV input to have available day usage whilst recharging and fully recharged batteries at night. Utilizing our above examples, having a solar generator with one 100 amp/hr battery and one 140 watt PV panel would yield a 5.7 hour recharging time after using its allocated storage capacity (800/140). A SolMan Action Packer with separate folding solar array, and inter-tied Honda gas generator, creating a hybrid system. 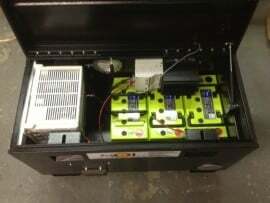 Furthermore, adding high quality components and balancing the system design to boost portability will assure that a solar generator can work in a variety of environments, applications and needs. When you are building your Tiny Home or upgrading it to solar, there are some key steps and components you will need to give your Tiny Home solar power, as well as maximum electrical adaptability for any situation you may be in traveling or landing to. Firstly, a 50 to 100 foot contractor grade extension cord is needed, either 10 gauge or 12 gauge (thicker, for more electric). The male end, you will plug into your solar power system’s duplex outlet. You could also plug into any standard 15 or 20 amp duplex outlet on a house, garage or outside plug at a property you have the Tiny House parked at. Similarly, for a gas generator as needed, plugged into the 20 amp duplex outlet on it. The Female end of cord, you plug into the side of your Tiny Home. This type of plug should be installed into a double gang box, in which you have all your electric and lighting circuits running to. A patio outdoor cover is made for this also, which is a single round hole with hinged cover. These receptacles can be bought at any decent building or electrical supply store. 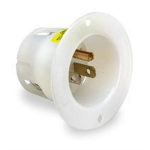 McMaster-Carr online is a great resource for electric plugs. If you plan on putting a sub panel and breakers into your Tiny Home, you should still run all the electric from that plug. Also, understand that if you are pulling power in from one solar generator or system circuit it will be maxed at 15 or 20 amps top, based on the circuit breakers on your source power. If you want more than a 20-amp service to your Tiny house, a higher amperage plug is needed, generally with twist lock or Y type plugs. You also need bigger sources and the same plugs on your solar power system you plug into that will match the amperage rating on the circuit (30 amps or more). In some cases, these can go to 220 volts, where you can get two 15 or 20 amp circuits at 110 volts into your box, but you must pay attention to the type of sub-panel box and how it is wired for this. Some of these 30 amp type plugs are also seen in the RV and trailer world, but pay attention to the type of plug, as there are 120 volt only, as well as a lot of variations, and sometimes you need an adapter to get it to work on different power sources. Please note that if you plan on having high-energy draw applications it is recommended to separate out to multiple circuits in a sub-panel box, with a much bigger feed, generally 220v at 30 to 50 amps. Your solar power system will also need to be sized appropriately to handle this feed. In terms of internal wiring, 14-gauge standard romex wire is the standard choice for a Tiny Home. This wiring is ideally done while framing is open and before any inside walls are completed. As for distances of extension cords to your solar power system, we recommend no more that 100 feet with a 10 gauge cord or wire, for 15 to 20 amps maximum. Any 30 amp or more service cord will need to go to a heavy 8 gauge wire or bigger for distance to source, because of the resistance in the line. 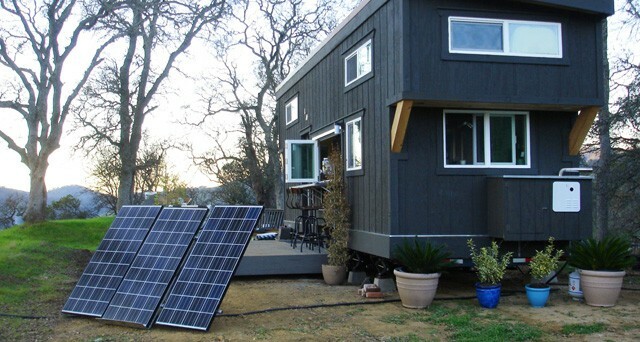 Your Tiny Home is now ready for solar power electricity. ATTENTION: Please be extremely cautious with electricity, especially 220v, and get professional help when you are wiring your home, as this can put you or users of your Tiny Home in danger of shorts, fires, or shocks if not done correctly! Solar power fits well with the Tiny Home lifestyle and the values of efficiency and sustainability. When building a Tiny Home or upgrading it to solar, it is important to keep in mind and understand your power needs and design specifications. Portable solar generators seem to be a more solid pairing with the mobile nature of Tiny Homes, but fully installed systems can be effective as well. 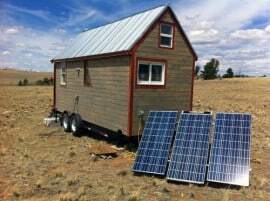 Ultimately, solar power for Tiny Homes requires power management and planning to ensure you have ample electricity for the specific uses a Tiny Home desires. Following these steps for off-grid solar power allows a Tiny Home to be ready-to-go, adaptable and sustainable, for anywhere and anything the future has to offer.